I primarily use Mail.app for my Exchange mail account. But I need to keep Outlook around for those rare cases I need it (for instance editing distribution lists on the server). 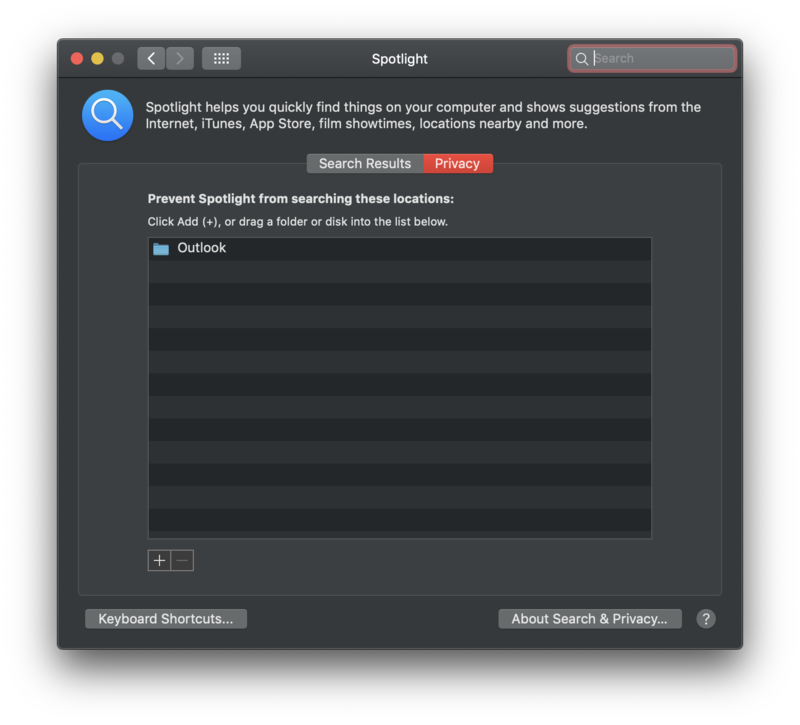 But this makes Spotlight searches really convoluted. Every mail shows up twice. Is there any way I can disable the content from individual apps from being part of the Spotlight index? Or an obscure setting (I've looked) inside Outlook that disables Spotlight indexing? Drag the Outlook folder into the privacy tab you opened earlier within System Preferences. Open Spotlight under System settings and go to the Exceptions tab. ...now everything from Outlook is excempt from Spotlight. Not the answer you're looking for? Browse other questions tagged email ms-office spotlight . Needs Office for Mac 2011 Outlook Spotlight? How to get Outlook email indexed by Spotlight after reinstalling Office 2011?